Built for paddling on flat water, short or long distance, the VESL Touring displacement hull splits the water like a razor but the generous width reduces wobble. This translates to going fast without worrying about falling over. You can also take long day trips or overnight trips thanks to the board’s thickness and deck leash plugs. It is equipped with 4 nose leash plugs to tie down all your gear. This shape optimizes flat water glide and tracking. With the VESL bamboo series we have created a board that is lighter, stronger, and better for the environment. 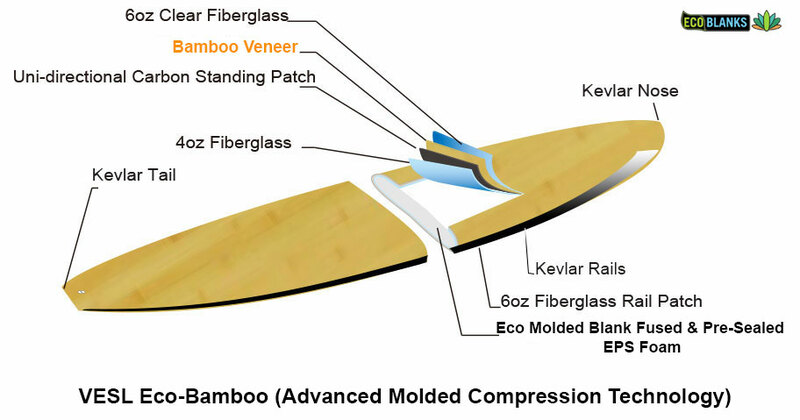 The Vesl Bamboo Eco Series paddle boards are made up of real bamboo wood veneers utilizing one of the most renewable resources on earth that will provide you with years of reliable performance and fun. Why choose a VESL TOURING displacement hull paddle board? Displacement hulls are more commonly used on boats, kayaks and canoes because they are more efficient at cutting through the water, better at staying on course and they glide with less effort. 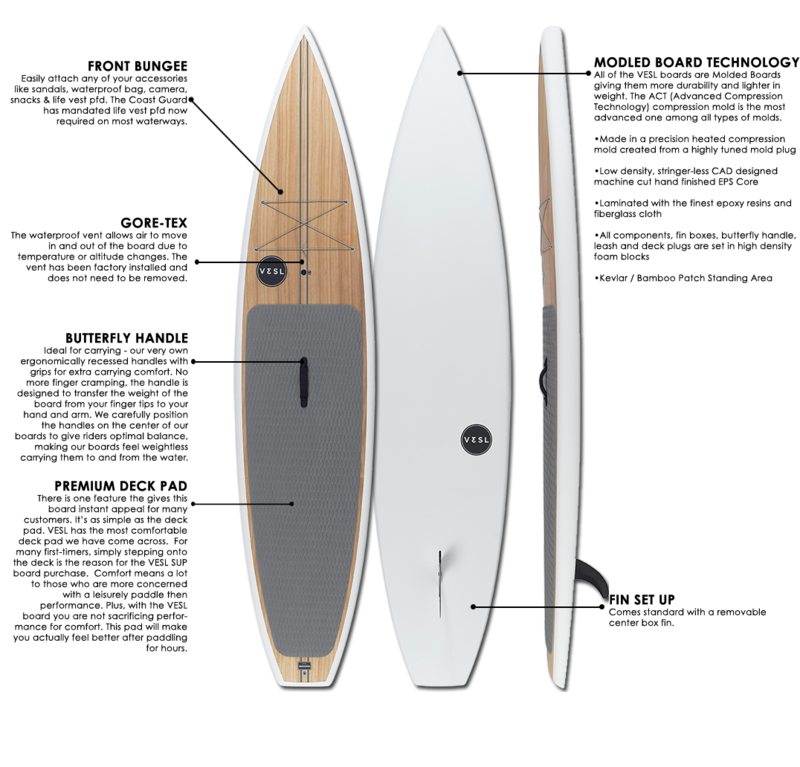 This board features displacement hulls designed to efficiently part the water as you paddle. These types of paddle boards excel at longer distance touring, racing, recreational and fitness paddling anywhere outside the surf zone including cruising coastlines, bays, lakes and rivers. Rider Weight Capacity: Paddlers Up to 280 lbs. VESL BOARD PACKAGES OFFER THE BEST LOOKS, LIGHT WEIGHT, DURABILITY, PERFORMACE AND PRICE ANYWHERE! The VESL Eco Bamboo paddle board package comes complete with Adjustable Paddle, comfortable EVA deck pad, integrated butterfly carry handle, Compression Molded Eco-Bamboo Construction and a 9" Flex-Foil center fin. HEATED COMPRESSION MOLDED TECHNOLOGY: All of the VESL 2017 boards feature the most advanced compression molding technology. 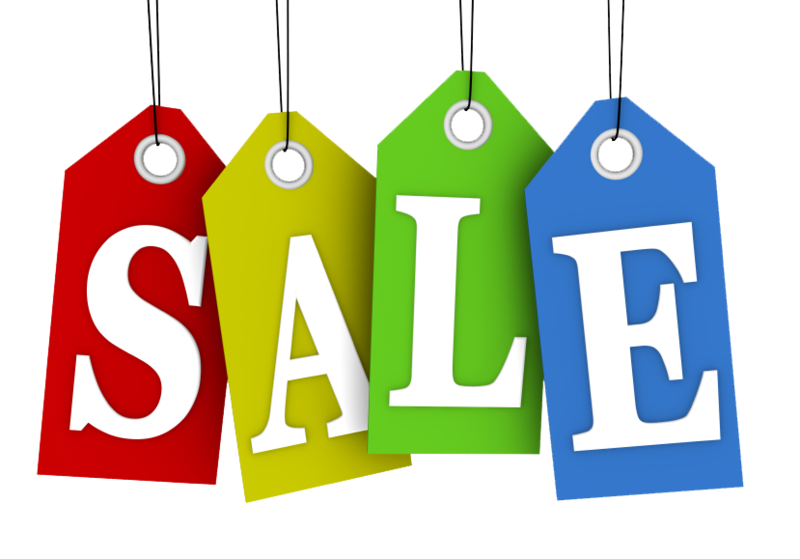 The superiority of molded boards is better strength and durability with lighter weight. The average board weight has been reduced by 2 to 3.5 lbs. Based on the different sizes the board strength has been enhanced by 25-30%. The rails, nose and tail are reinforced with kevlar. A unidirectional carbon fiber standing patch has also been added. VESL BOARD PACKAGES OFFER THE BEST LOOKS, LIGHT WEIGHT, DURABILITY, PERFORMANCE AND PRICE ANYWHERE! 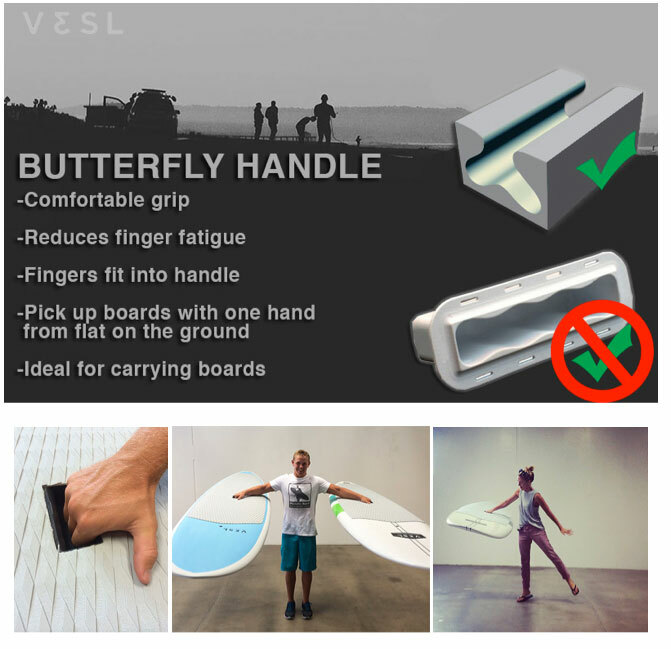 The VESL paddle board package comes complete with a Adjustable Carbon Paddle, Comfortable EVA deck pad, integrated butterfly carry handle, Compression Molding Technology Construction, 9" Flex-Foil center fin.